This is the famous Cook’s Illustrated recipe – their “foolproof pie dough” made with vodka. I’m no fool, but I can vouch that it’s a really easy dough to work with and the crust is tender, flaky, and tasty. This dough is removed from the food processor a little earlier than other recipes and finished in a bowl where it’s pressed together with a spatula. López-Alt says the pressing helps to make the dough flaky rather than short. If you have piles of Cook’s Illustrated magazines at home, like I do, you’ll find the double-crust version of this recipe in both the September 2010 and November 2007 issues. The September 2010 issue also has a two-page feature on Foolproof Pie Dough 101 that includes illustrations of rolling, transferring, fitting, trimming, and crimping the dough, as well as the rationale behind the recipe. Before you start, make sure your butter, shortening, vodka, and water are chilled. Some people even chill the flour and if you’re so inclined, why not. Chilling helps prevent the butter from softening from the heat produced by the friction of the processor and your hands. Instead, the chill keeps the butter in little solid bits, perfect for flaking when it does finally melt, steam, and expand in the oven. If you don’t own a food processor, and can’t borrow one, you could do this in a chilled bowl with a pastry blender, but it will take some time. If you’re using a pastry blender, chill the bowl and dough every now and then to keep everything cold enough. This recipe makes one 9-inch single pie crust. See below for the ingredients for a double crust. You’ll need a food processor, rubber or silicone spatula, medium bowl, plastic wrap, rolling pin, and 9” pie plate. You’ll need parchment paper and pie weights or beans if you’re blind-baking the crust. Process 3/4 cup of the flour, salt, and sugar in a food processor until combined, about 2 one-second pulses. Add the butter and shortening and process until a homogeneous dough just starts to collect in uneven clumps, about 15 seconds. The dough will resemble cottage cheese curds and there should be no uncoated flour. Scrape the bowl with a rubber spatula and redistribute it evenly around the processor blade. Add the remaining 1/2 cup flour and pulse until the mixture is evenly distributed around the bowl and the mass of dough has been broken up, 4 to 6 quick pulses. Empty the dough into a bowl. Sprinkle the vodka and water over the dough. With a spatula, use a folding motion to mix, pressing down on the dough until it’s slightly tacky and sticks together. Flatten the dough into a 4-inch disk. Wrap it in plastic wrap and refrigerate for at least 45 minutes or up to 2 days. Remove the dough from the refrigerator and roll it out on generously floured (up to ¼ cup) work surface to a 12” circle about 1/8” thick. Roll the dough loosely around the rolling pin and unroll it into the pie plate, leaving at least 1” overhang on each side. Or you can gently fold the dough in half, than half again. Line up the corner of the dough in the center of the pie plate and gently unfold. Working around its circumference, ease the dough into the plate by gently lifting the edge of the dough with one hand while pressing it into the plate bottom (near the rim) with other hand. Leave the overhanging dough in place and refrigerate until the dough is firm, about 30 minutes. Trim the overhang to 1/2” beyond the lip of the pie plate. Fold the overhang under itself – the folded edge should be flush with the edge of the pie plate. Flute the dough or press the tines of a fork against the dough to flatten it against the rim of the pie plate. Refrigerate the dough-lined plate again until it’s firm, about 15 minutes – more time in the frig can’t hurt, I usually do another 30 minutes at least. If you are blind-baking the crust, adjust the oven rack to its lowest position, place a rimmed baking sheet on the oven rack, and preheat the oven to 425. 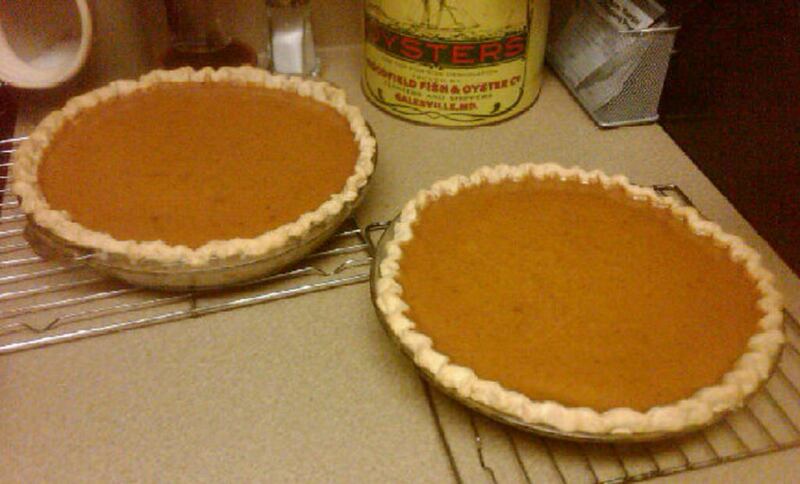 Remove the pie pan from the refrigerator, line the crust with parchment paper, and fill it with pie weights or beans. Bake for 15 minutes. Remove the paper and weights, rotate the plate, and bake for another 5 to 10 minutes until the crust is golden brown and crisp. Process 1-1/2 cups flour, salt, and sugar in the food processor until combined, about 2 one-second pulses. Add the butter and shortening and process until a homogeneous dough just starts to collect in uneven clumps, about 15 seconds. The dough will resemble cottage cheese curds and there should be no uncoated flour. Scrape the bowl with a spatula and redistribute it evenly around the processor blade. Add the remaining 1 cup flour and pulse until the mixture is evenly distributed around the bowl and the mass of dough has been broken up, 4 to 6 quick pulses. Empty the dough into a bowl. Sprinkle the vodka and water over the mixture. With a spatula, use a folding motion to mix, pressing down on the dough until it’s slightly tacky and sticks together. Divide the dough into two even balls and flatten each into 4” disk. Wrap each of them in plastic wrap and refrigerate for at least 45 minutes or up to 2 days.